The Mustang Canyon Western Bed Sets begin with a single layer blanket cover with button hole stitched edges in dark tones of brown, rust, navy and tan with a touch of green. 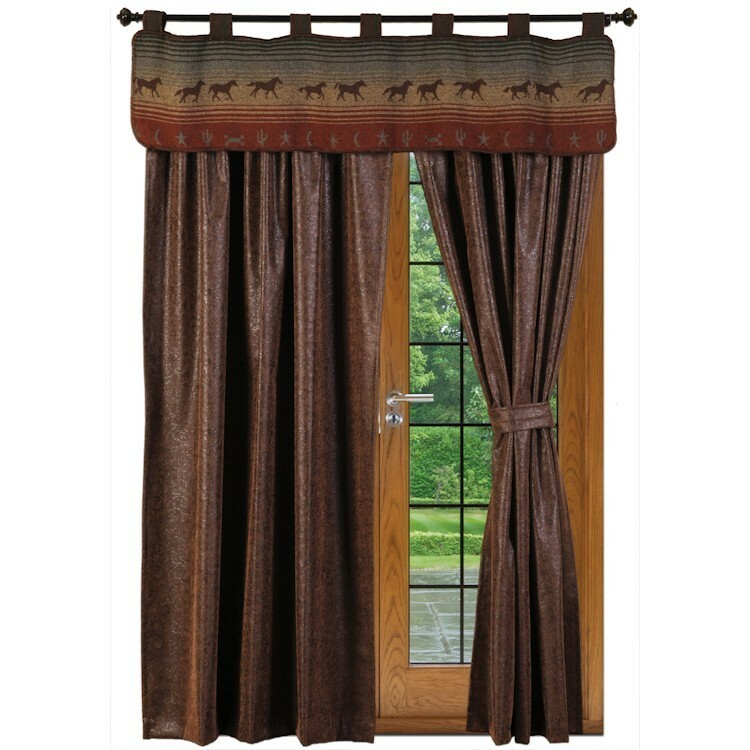 These warm desert colors are featured in horizontal stripes with images of running horses, stars and cactus. The pillow shams are a soft two tone gray herringbone fabric with a leather band and silver tone conchos and leather fringe. The finishing touch is a tailored faux leather bedskirt with the look of tooled leather. Each deluxe set includes with three euro shams (two of the mustang canyon fabric and one of the same embossed faux leather as the bed skirt accented with decorative fringe). 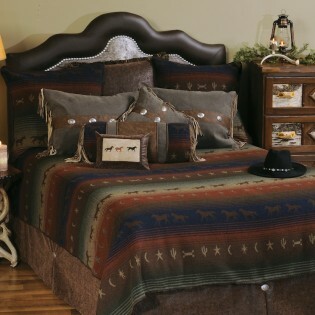 The Mustang Canyon Western Bed Sets begin with a single layer blanket cover with button hole stitched edges in dark tones of brown, rust, navy and tan with a touch of green. These warm desert colors are featured in horizontal stripes with images of running horses, stars and cactus. 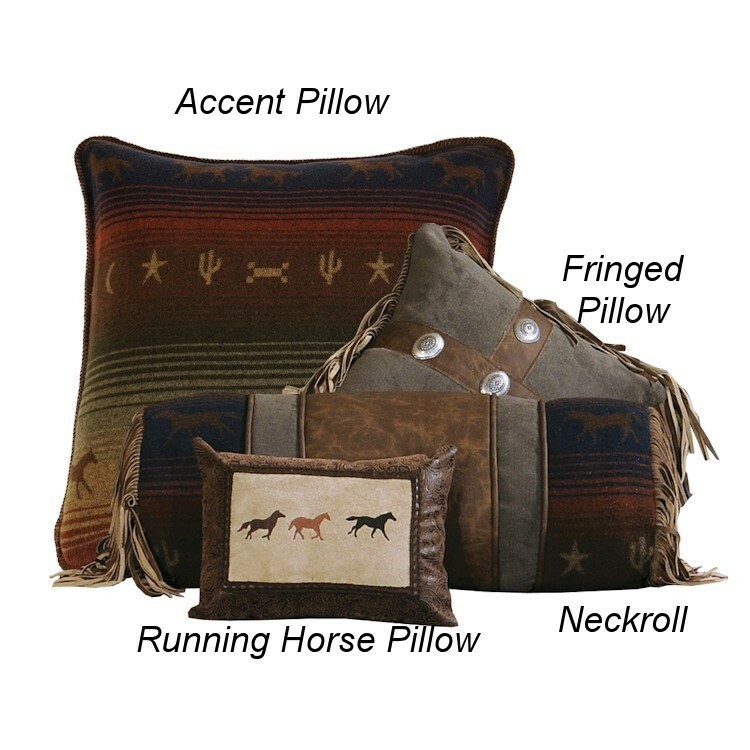 The pillow shams are a soft two tone gray herringbone fabric with a leather band and silver tone conchos and leather fringe. The finishing touch is a tailored faux leather bedskirt with the look of tooled leather. Each deluxe set includes with three euro shams (two of the mustang canyon fabric and one of the same embossed faux leather as the bed skirt accented with decorative fringe).